ONE OWNER, CLEAN VEHICLE HISTORY/NO ACCIDENTS REPORTED, SERVICE RECORDS AVAILABLE, RECENT TRADE, BLUETOOTH/HANDS FREE CELLPHONE, 2 SETS OF KEYS, and REMAINDER OF FACTORY WARRANTY. Driver Awareness Package (Forward Collision Alert, IntelliBeam Headlamps, and Safety Alert Seat), AWD, and 20" x 8" Polished Wheels. There are used SUVs, and then there are SUVs like this well-taken care of 2015 Cadillac SRX. This luxury vehicle has it all, from a posh interior to a wealth of terrific features. If you want a creampuff with style, this is it. It is nicely equipped with features such as Driver Awareness Package (Forward Collision Alert, IntelliBeam Headlamps, and Safety Alert Seat), 2 SETS OF KEYS, 20" x 8" Polished Wheels, AWD, BLUETOOTH/HANDS FREE CELLPHONE, CLEAN VEHICLE HISTORY/NO ACCIDENTS REPORTED, ONE OWNER, RECENT TRADE, REMAINDER OF FACTORY WARRANTY, and SERVICE RECORDS AVAILABLE. 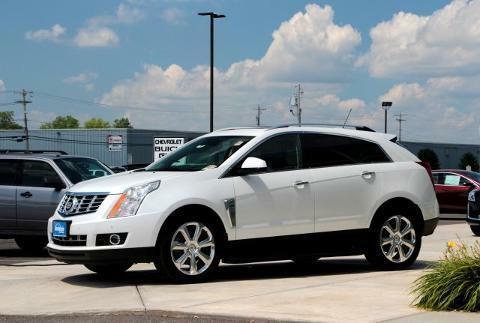 Climb into this fantastic SRX and be impressed by the low mileage number staring back at you. This baby's life is just getting started.